Welcome to the Epic MegaJam! 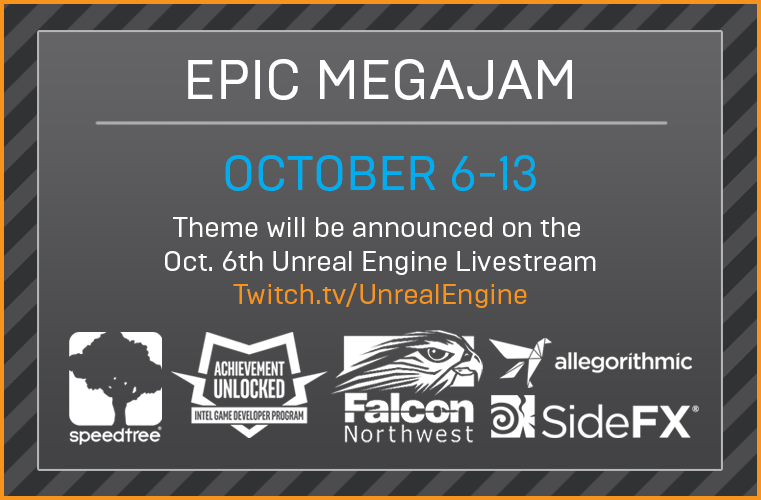 We have had TWO YEARS of #ue4jams, so once again we're making the October event into a massive extravaganza! Larger prizes, more award categories, and partner sponsorship are all in store for those wanting to take part in this event of Epic proportions. Work alone or with a team (up to 5 members) to make the most incredible project based on the theme in Unreal Engine 4, and submit before the deadline. The game must not be an obvious extension of one of Epic Games’ official Unreal Engine tutorials. Must be packaged for Windows or Mac OS. No full, unpackaged projects. VR projects are accepted. In Unreal Engine game jam tradition, we'll be kicking this one off and announcing the theme on the livestream on October 6 and giving participants an entire week to create and submit an awesome game built in the engine. This year we have three raffles that all submissions will be entered into, three visual awards chosen by Allegorithmic, three special categories with prizes and a Grand Prize raffle, plus prizes, for the finalist teams. We judge submissions for their aesthetic, unique use of the theme and gameplay on a 1-5 point scale and the top 3 teams will be declared the winners. All participants of the who submit a valid entry will be entered into a drawing to win a brand new NUC Kit. Based on the total count of qualifying submissions, we'll be raffling off a number of NUCs! Here's the breakdown. All participants of the who submit a valid entry will be entered into a drawing to win a SpeedTree swag pack. Based on the total count of qualifying submissions, we'll be raffling off a number of packs that include a $150 Gift card + 1 year SpeedTree subscription + a SpeedTree t-shirt! Here's the breakdown. All participants of the who submit a valid entry will be entered into a drawing to win a SideFX prize pack, which includes a Houdini Indie License, Houdini/SideFX swag and a t-shirt. Just like last year, our sponsor Allegorithmic will pick the top three most visually appealing entries to win licenses to Substance Live. The first place winner will receive a one year license per team member, second place gets a Substance Live six month license per team member, and for third place a Substance Live three month license will be given to each team member. "Coolest Character Design" for the game with the most awesome and unique characters. "Best Game Under 100mb" for the best game that doesn't take up too much space. Winners of these special category prizes will be rewarded with Unreal Engine stickers/buttons, an Unreal Engine Game Jam t-shirt per team member, a Fortnite Alpha access key per team member, and a Shadow Complex Remastered key for Steam per team member. An Unreal Engine Game Jam t-shirt per team member, a Fortnite Alpha access key per team member, a Shadow Complex Remastered key for Steam per team member, a one year license for Houdini Indie per team member, a Houdini Indie promotional material package per team member, a SpeedTree t-shirt per team member, a one-year subscription to SpeedTree per team member, and a $500 SpeedTree coupon (one per team). All submissions will be featured in a highlight reel posted to our YouTube and shown on Twitch. All winning members will receive an Epic swag bag amongst numerous other items, a "Game Jam Finalist" forum badge, a featured playthrough on the October 27 Twitch stream, as well as a highlight on Unreal Engine blog! Last edited by Alexander Paschall; 10-27-2016, 11:34 PM. Reason: TEAMS!!!! I'd like to get a team or teams sorted from the London Unreal Engine Meetup. I could organise a venue for us to meet up at the weekend. Beer, pizzas and dev! I'm @londonisunreal, the organiser of the London Unreal Engine Meetup group. Just want to check, is it ok to use assets bought on the Marketplace? [MENTION=77286]AxelRantila[/MENTION]: In the other gamejams it's allowed to use Assets which were not made by a teammember, but you have to declare it! Since Epic didn't prohibit the use of 3rd Party assets in the anouncement, there is no reason not to use them. Sad, I can only travel around NRW and some cities around, everything else is too far/expensive <3. Is it ok to use custom builds of UE4 for this? Other games jams can sometimes be quite restrictive about that kind of thing. As long as it came from Unreal Engine, we don't have any rules against editing source for your jam project. Just make sure that you mention any previously created content in your submission post is all. Thanks for the reply. Just to confirm though, we normally use either NVIDIA's VXGI build, or lately GalaxyMan2015's complete GameWorks build. Are these acceptable as long as they're disclosed? Or is it only modifications we've made ourselves to the source?